When you hear the word ‘robot’, what do you picture? For many, it is likely that some sort of metal-based machine comes to mind. As someone who grew up watching quite a few science fiction movies, I picture something similar as well. Yet, this is only one kind of robot. The growing field of soft robotics looks to create a new kind of robot that can be used in situations where traditional metallic robots are deemed unsuitable. 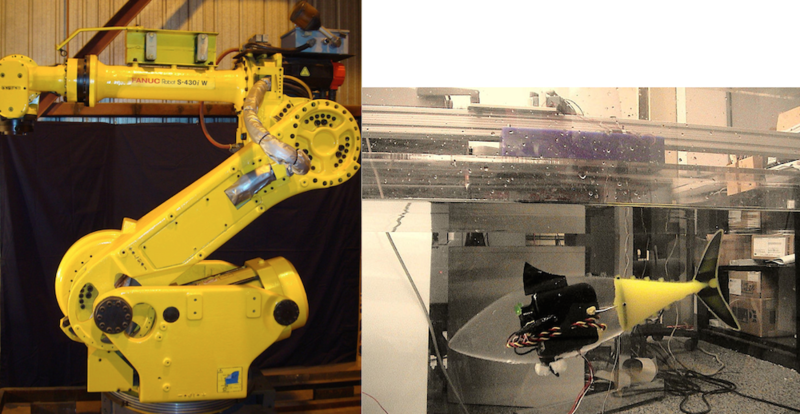 Left: An industrial metal robot. Image by Kitmondo PPM. Licensed under CC BY 2.0, via Flickr Creative Commons. Right: A soft robot with a fish-like design. At its core, soft robotics is the study of nonrigid robots made of soft materials, which can include anything from plastic and silicon to rubber and fabric. Such materials give soft robots an inherent structural flexibility, allowing them to alter their shape and easily move throughout cluttered environments. Because these materials are cheaper than the metals used in more common robotic systems, soft robots may also have lower production costs. Further, these robots are advantageous in the sense that their soft bodies are less likely to cause physical harm, making them safer to use around humans. There are, of course, some bumps in the road when it comes to the development of soft robots. Many of these issues stem from the fact that soft robotics is a younger field. 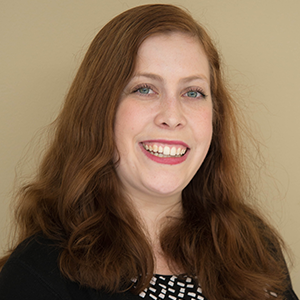 Determining which tools, methods, and materials work best and proving their real-world applicability are necessary steps. Today, we’ll look at some of the recent progress that has been made toward meeting these goals. Soft robots typically use hydraulic or pneumatic actuators as artificial muscles. But such actuators don’t allow for quick movement. To help speed up soft robots, one group of scientists developed a low-voltage dielectric elastomer that has no rigid components. This actuator design offers new potential in engineering systems that more closely mimic muscle-like performance and in turn paves the way for new applications of soft robotics. Actuators aren’t the only part of a soft robot that requires further research. The material covering a soft robot must be soft, stretchable, and functional. One solution to achieving such a balance is an electronic “skin” that can stretch to accommodate a soft robot’s movement, while still maintaining its ability to display light. Using this material, it’s possible to design soft robots that can display a patient’s pulse and temperature, a characteristic that can be quite useful in places like hospitals. An example of stretchable electronic skin, used on a human in this case. Image by Steve Jurvetson — Own Work. Licensed under CC BY 2.0, via Flickr Creative Commons. A humanoid robot, however, is just one example of a soft robot. When designing these machines, many researchers look to other living organisms, whose bodies are comprised of flexible materials that can easily change shape, for inspiration. One such creature is a caterpillar. 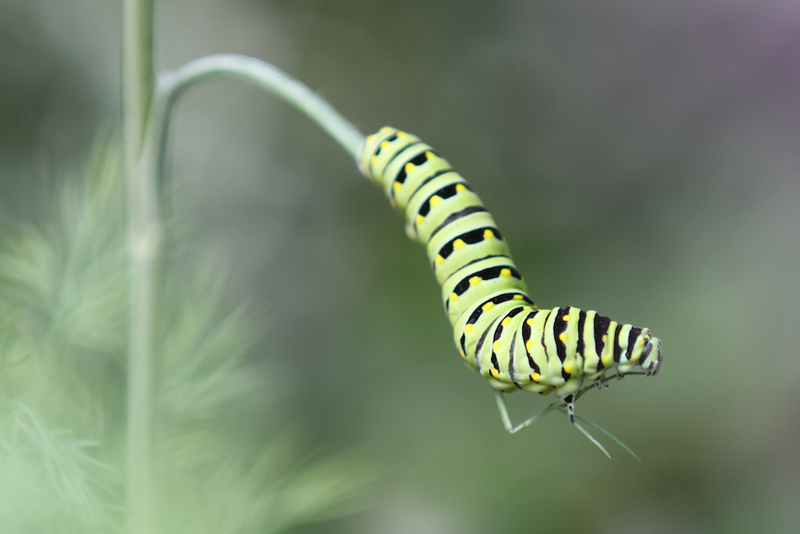 A caterpillar is one living organism that is inspiring the design of soft robots. Image by Dan Zen — Own Work. Licensed under CC BY 2.0, via Flickr Creative Commons. Able to rest on a fingertip, a caterpillar-inspired soft robot is tiny and, at first glance, unassuming. But when controlled by an external laser, the robot can move on its own and carry ten times its own weight. The laser alters the shapes of molecules inside the robot to induce movement, without the need for an outside power source. Ocean-dwelling creatures are another common source of inspiration in soft robotics. Consider an octopus, for example. With its malleable body, this creature easily moves through open water and tight spaces. As such, many research teams have sought to replicate the movements of an octopus in their robot designs. 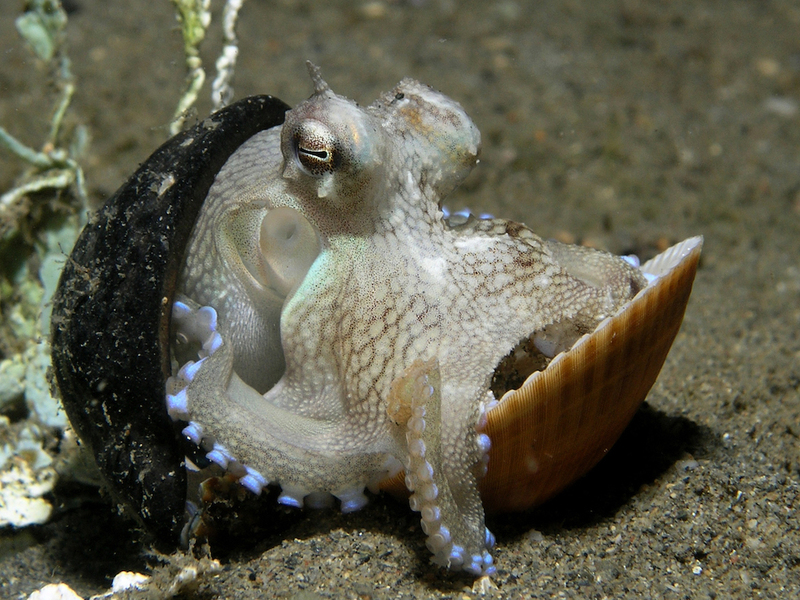 An octopus uses its soft body to hide between two shells. Image by Nick Hobgood — Own Work. Licensed under CC BY-SA 3.0, via Wikimedia Commons. One design, nicknamed the octobot, is the first completely soft and autonomous robot. The octobot combines pneumatic-based power and a microfluidic logic circuit to move and control its reactions without the need for tethers. To fabricate this robot, the researchers used three different methods: soft lithography, molding, and 3D printing. They are hopeful that their robot will help inspire the next generation of soft robots and foster the development of more complex designs. Meanwhile, another research team created an octopus-inspired robot that can use its flexibility to help researchers explore the ocean. The robot’s design allows it to easily navigate through and investigate tight spaces on the seafloor. In fact, the researchers behind the robot’s development have already sent it out for its first dip in the ocean. These are, of course, only a handful of the advancements that have emerged in the field of soft robotics. As further research is performed and the designs of soft robots improve, more doors will open up and the scope of these flexible machines will extend to a variety of applications.